The Progress M1-5 cargo ship, the last spacecraft to visit Russian Mir space station, rolled out to the launch pad at Site 1 in Baikonur Cosmodrome on Tuesday morning, local time. The Soyuz launch vehicle with the Progress M1-5 under its payload fairing left the assembly building at Site 2 at 05:00 Moscow Time and was lifted into vertical position on the launch pad by 07:00. 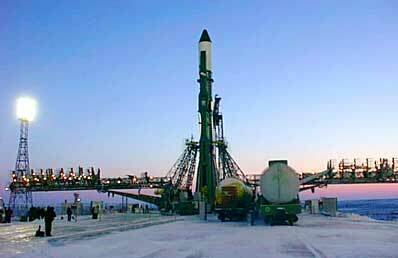 The launch is scheduled for 09:57 Moscow Time on Thursday (0657 GMT; 0157 EST). 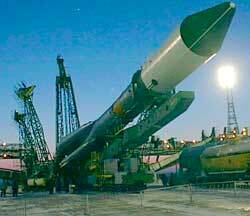 The cargo ship is expected to dock with Mir four days later. In the meantime, the Soyuz TM spacecraft with the crew of two is being readied for launch on February 10, in case if automatic docking between Progress M1-5 and Mir fails. At the end of February or beginning of March, ground controllers in Korolev plan to use the propellant and the engines onboard the Progress M1-5, to push Mir space station off the orbit for a reentry into the atmosphere. Burning remains of the station are expected to fall in the Pacific Ocean, east of New Zealand.